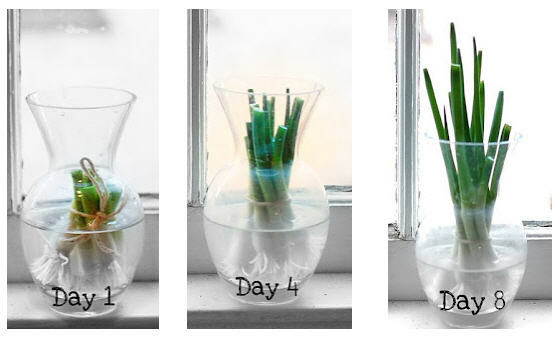 Did you know you could grow green onions...at home...in just water? Yes, that means one batch of green onions can provide months supply of fresh scallions. It also provides a pretty splash of green on a kitchen window sill. When you need green onions in a recipe, go ahead and cut off the green ends to use. Keep the white parts and tie with kitchen twine to keep them together. This isn't a must, but helps when using a vase so they all stay upright and grow out of the vase. Place your green onions in a small clear glass or clear vase. Fill with water until about half of the onions are covered in water. Put in a sunny window sill and watch them grow! Look at how quick they grow! Great idea! How many times can you do this with the same bunch of onions? Doug, I've done it 4-5 times in the past before I felt like the onions dried out a little too much. I've heard of people doing it much more than that though! Thanks! I just put them in the window sill, can't wait to see the results!